The Indigenous Aquaculture Initiative unites traditional knowledge and modern science in participatory research aimed at meeting local food needs. The Amazon is the worlds richest region for freshwater fish species yet overfishing, habitat destruction, and pollution have begun to take a toll on fish populations. In addition, indigenous peoples are losing traditional hunting and fishing grounds to settlers, logging, and agro-industry and must survive on a much smaller land base. Fish are important in the traditional diet, and aquaculture is a highly attractive, feasible solution that can sustain the people while protecting the environment. ISIS has been working with Secoya fish farmers since 1997 to develop an Amazonian aquaculture appropriate to the local environment and Secoya culture. The Initiative supports an environmentally sound approach to fish-farming using native species and renewable local resources. It uses indigenous lore, low-scale technology, appropriate technical training, and community effort to create a sustainable, community-controlled system for production of high quality, high protein food for local consumption. For more on our work with the Secoya - the fish being farmed, the methods used, and the results - see our aquaculture "photo essay." ISIS and our Secoya partners are very interested in sharing our experiences with others facing similar challenges and working on appropriate solutions. 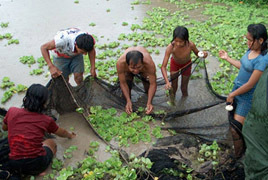 In 2001 we coordinated an aquaculture exchange with two Peruvian NGOs, ASPRODE and Minga Peru. Funded by Oxfam America and the Food Industry Crusade Against Hunger, the exchange was an opportunity for representatives from the beneficiary communities and their partner NGOs to visit one another and learn about each other's efforts, successes and challenges. Project Director Jim Oldham wrote a report in June 2001 at the end of the visits to Peru, discussing many of the lessons from our own work and some we gained by trading insights with others. ISIS has also prepared a Spanish-language brochure about the Aquaculture project. View it as a web page or as an Acrobat reader file (.pdf). The December, 2000 ISIS newsletter, After the Fact, includes a story about the pros, cons, and general progress of the Aquaculture project. Although some of the specifics are old news now, it offers a useful background on the concept of Fish Farmer Research. The local Daily Hampshire Gazette published an article about our Aquaculture work in June of 1999. Read it here. These Amazon Projects pages are historical. For current information, please visit laslianas.org. All Indigenous Aquaculture photos: Jim Oldham.